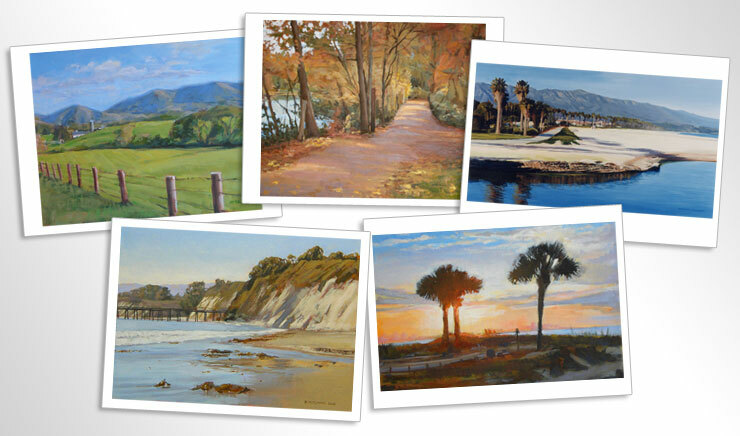 I am delighted to offer a set of 5 greeting cards that feature my landscape paintings. This set of greeting cards developed organically from promoting my artwork. 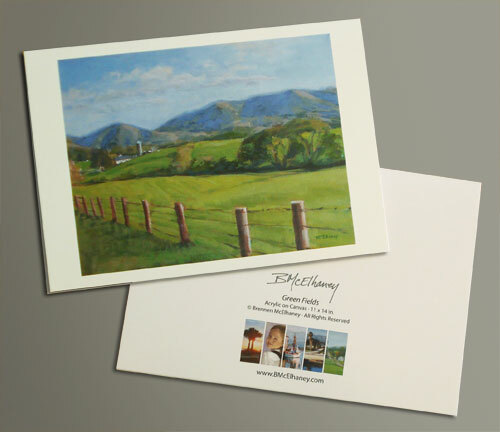 I produced one card, “Green Fields”, for a campaign to introduce my artwork to major donors of the Asheville Art Museum – http://www.ashevilleart.org . And while postcards are nice (and more cost effective), they don’t have the same class as a greeting card — especially a hand written card in a hand addressed envelope. I must give special thanks to Alyson Stanfiled and other Facebook friends and fans that offered their encouragement and input for selecting images. Also, thanks to PSPrint – http://psprint.com – for handling the printing and production. The set of 5 cards are available for purchase on my website. Brennen: Great choices! I love the top center for the fall season, but I really love the upper right one because of the high, clear contrast and the strong diagonal line. Makes a big impact. Your price is great! You can’t find $2 cards anywhere anymore. I hope people take advantage and stock up. Brennen, your artwork on the cards is fantastic! What a wonderful, supportive friend you have, too! I wanted to thank you for answering my question on Alyson’s Facebook post about the cards and PSPrints. I really appreciate your input. Lana: Thank you for your note! A tad bit more info on PSPrint – They run a 60% off sale on greeting cards every couple months. I would advise taking advantage of that! Also, I’d recommend ordering at least 250 which is the minimum quantity for offset print cards. Wishing you much success!